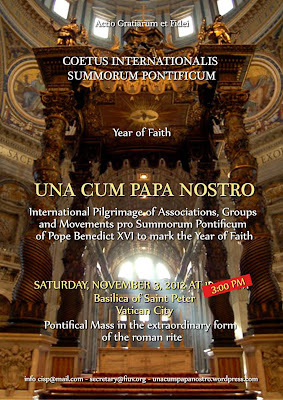 At the behest of a reader, this open thread and open board is for all those who wish to send us news, and wish to contact other pilgrims during the November 1-3, 2012, Traditional Pilgrimage to Rome. You are welcome to add any related information. Cardinal Cañizares: "I celebrate the Traditional Mass because it is normal to do so"
When Constantine, ... born of an emperor, a pious son of a most pious and prudent father, and Licinius, second to him, — two God-beloved emperors, honored alike for their intelligence and their piety—being stirred up against the two most impious tyrants by God, the absolute Ruler and Savior of all, engaged in formal war against them, with God as their ally, Maxentius was defeated at Rome by Constantine in a remarkable manner, and the tyrant of the East did not long survive him, but met a most shameful death at the hand of Licinius, who had not yet become insane. Constantine, who was the superior both in dignity and imperial rank, first took compassion upon those who were oppressed at Rome, and having invoked in prayer the God of heaven, and his Word, and Jesus Christ himself, the Savior of all, as his aid, advanced with his whole army, proposing to restore to the Romans their ancestral liberty. But Maxentius, putting confidence rather in the arts of sorcery than in the devotion of his subjects, did not dare to go forth beyond the gates of the city, but fortified every place and district and town which was enslaved by him, in the neighborhood of Rome and in all Italy, with an immense multitude of troops and with innumerable bands of soldiers. But the emperor, relying upon the assistance of God, attacked the first, second, and third army of the tyrant, and conquered them all; and having advanced through the greater part of Italy, was already very near Rome. Then, that he might not be compelled to wage war with the Romans for the sake of the tyrant, God himself drew the latter, as if bound in chains, some distance without the gates, and confirmed those threats against the impious which had been anciently inscribed in sacred books—disbelieved, indeed, by most as a myth, but believed by the faithful,— confirmed them, in a word, by the deed itself to all, both believers and unbelievers, that saw the wonder with their eyes. Thus, as in the time of Moses himself and of the ancient God-beloved race of Hebrews, he cast Pharaoh's chariots and host into the sea, and overwhelmed his chosen charioteers in the Red Sea, and covered them with the flood, in the same way Maxentius also with his soldiers and body-guards went down into the depths like a stone, when he fled before the power of God which was with Constantine, and passed through the river which lay in his way, over which he had formed a bridge with boats, and thus prepared the means of his own destruction. In regard to him one might say, he dug a pit and opened it and fell into the hole which he had made; his labor shall turn upon his own head, and his unrighteousness shall fall upon his own crown. These and the like praises Constantine, by his very deeds, sang to God, the universal Ruler, and Author of his victory, as he entered Rome in triumph. Immediately all the members of the Senate and the other most celebrated men, with the whole Roman people, together with children and women, received him as their deliverer, their savior, and their benefactor, with shining eyes and with their whole souls, with shouts of gladness and unbounded joy. But he, as one possessed of inborn piety toward God, did not exult in the shouts, nor was he elated by the praises; but perceiving that his aid was from God, he immediately commanded that a trophy of the Savior's passion be put in the hand of his own statue. And when he had placed it, with the saving sign of the cross in its right hand, in the most public place in Rome, he commanded that the following inscription should be engraved upon it in the Roman tongue: "By this salutary sign, the true proof of bravery, I have saved and freed your city from the yoke of the tyrant and moreover, having set at liberty both the senate and the people of Rome, I have restored them to their ancient distinction and splendor." Before thanking you on my part, I would like to make an announcement. 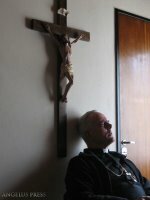 In the context of the reflections of the Synod of Bishops, "The New Evangelization for the Transmission of the Christian Faith," and at the end of a process of reflection on the themes of seminaries and Catechesis, I am pleased to announce that I have decided, after further reflection and prayer to transfer jurisdiction over Seminaries from the Congregation for Catholic Education, to the Congregation for the Clergy and competence of Catechesis from the Congregation for the Clergy, to the Pontifical Council for Promoting the New Evangelization. The Holy Father allowed the non-official publication of the final list of propositions of the Synod of Bishops on the "New Evangelization" in English - the official Latin text will be made available in the future. The Synod Fathers recognize the teaching of Vatican II as a vital instrument for transmitting the faith in the context of the New Evangelization. At the same time, they consider that the documents of the Council should be properly read and interpreted. Therefore, they wish to manifest their adherence to the thought of our Holy Father, Pope Benedict XVI, who has indicated the hermeneutical principle of reform within continuity so as to be able to discover in those texts the authentic spirit of the Council. “There is the "hermeneutic of reform", of renewal in the continuity of the one subject-Church which the Lord has given to us. She is a subject which increases in time and develops, yet always remaining the same, the one subject of the journeying People of God. [...] However, wherever this interpretation guided the implementation of the Council, new life developed and new fruit ripened” (Benedict XVI, Address to the Roman Curia, 22 December 2005). In this way it will be possible to respond to the need for renewal required by the modern world and, at the same time, faithfully preserve the identity of the Church’s nature and mission. of the Pontifical Commission "Ecclesia Dei"
The Pontifical Commission "Ecclesia Dei" takes this occasion to announce that, in its most recent official communication (6 September 2012), the Priestly Fraternity of St. Pius X has indicated that additional time for reflection and study is needed on their part as they prepare their response to the Holy See’s latest initiatives. The current stage in the ongoing discussions between the Holy See and the Priestly Fraternity follows three years of doctrinal and theological dialogues during which a joint commission met eight times to study and discuss, among other matters, some disputed issues in the interpretation of certain documents of Vatican Council II. Once these doctrinal dialogues were concluded, it became possible to proceed to a phase of discussion more directly focused on the greatly desired reconciliation of the Priestly Fraternity of St. Pius X with the See of Peter. Other critical steps in this positive process of gradual reintegration had already been taken by the Holy See in 2007 with the extension of the Extraordinary Form of the Roman Rite to the Universal Church by the Motu Proprio Summorum Pontificum and in 2009 with the lifting of the excommunications. 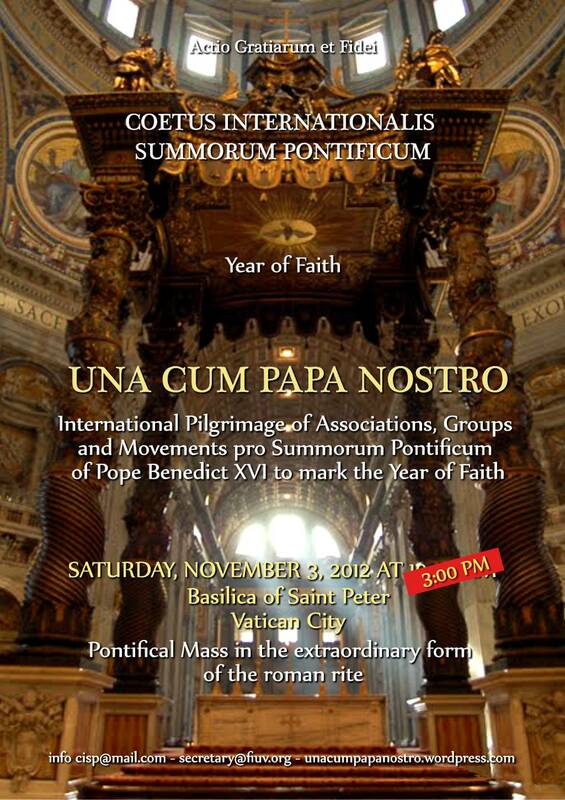 Just a few months ago, a culminating point along this difficult path was reached when, on 13 June 2012, the Pontifical Commission presented to the Priestly Fraternity of St. Pius X a doctrinal declaration together with a proposal for the canonical normalization of its status within the Catholic Church. At the present time, the Holy See is awaiting the official response of the superiors of the Priestly Fraternity to these two documents. After thirty years of separation, it is understandable that time is needed to absorb the significance of these recent developments. As Our Holy Father Pope Benedict XVI seeks to foster and preserve the unity of the Church by realizing the long hoped-for reconciliation of the Priestly Fraternity of St. Pius X with the See of Peter – a dramatic manifestation of the munus Petrinum in action – patience, serenity, perseverance and trust are needed. Thank you so much for your readership in the past few years. Adfero first mentioned this a couple of weeks ago, and here I am with a very unusual personal post, begging you for your urgent prayers and Mass intentions for the health and healing of my dear mother, MJ. I apologize for this unexpected personal request, in a moment of intense distress. Among the six new cardinals nominated yesterday, Luis Antonio Tagle of Manila has earned more than his share of fame (or notoriety) since his appointment to the Archdiocese of Manila a little more than a year ago. Tagle is one of the few prelates who is uniformly hailed by both the liberal and conservative wings of the international Catholic media for his ideas, his charisma and his speaking prowess, most of all during the current Synod and in this year's Eucharistic Congress in Ireland. This disciple of the Bologna School, who declared during his installation homily that Catholics and non-Catholics have but one mission and "must not compete against each other to get the better portion of the catch," has since then gone to ever-greater heights of popularity as one of the stars of the "new evangelization," if not as papabile. Speaking of the new evangelization, what does Archbishop Tagle think should be the way forward for the Church? The Church of Asia is often a minority Church, like John the Baptist crying in the wilderness…..even in the Philippines, if the Church is a majority, I realise that the sufferings of people and the difficult questions they ask are an invitation to be first in solidarity with them, not to pretend we have all the solutions….they can resonate and see the concrete face of God in a Church that can be silent with them, as confused as they are….it becomes a home for them…..
Father Grzegorz Sniadoch, of the Institute of the Good Shepherd (IBP), will become an official pastor for those attached to the Extraordinary Form of the Roman Rite in Białystok, northeastern Poland. 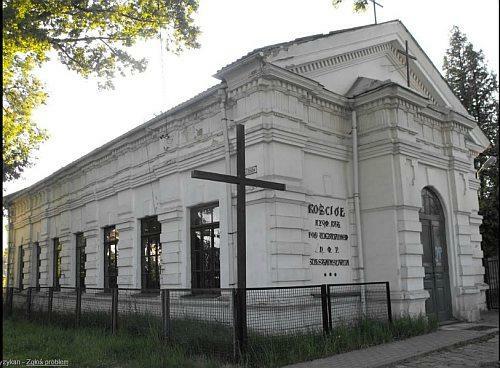 The Church of the Holy Name of the Blessed Virgin Mary and Saint Stanislaus the Martyr in Białystok will be the first church in Poland designated by a local bishop (Archbishop Edward Ozorowski) exclusively for the celebration of the Traditional Latin Mass and sacraments. The official opening of the chaplaincy will take place on September 28, 2012 (Christ the King), 10:30 AM. There are strong rumors now that, at the end of today's General Audience, the Pope will announce a consistory for the creation of new cardinals. Rorate has been independently given this information. Andrea Tornielli has a more detailed story. 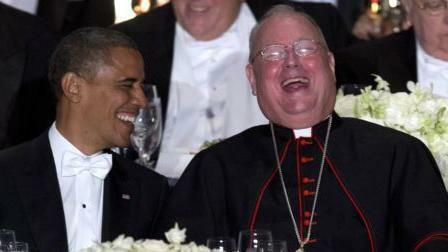 Tornielli reports that there may be as few as six new cardinals, and that none of them will be Italian. According to today's Bollettino of the Vatican Press Office, the Holy Father has just announced the elevation of the following to the cardinalate in a Consistory to be held on November 24, 2012. 6. 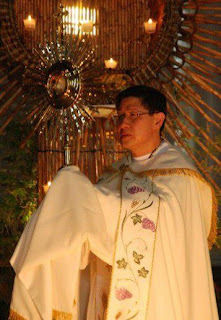 Archbishop LUIS ANTONIO TAGLE, Archbishop of Manila (Philippines). There are currently 116 cardinal electors. Two of them (Cardinal Arinze and Cardinal Martino) will turn 80 before November 24, leaving 114 cardinal electors on the morning of that day (barring any untimely deaths or unfortunate events). With the elevation to the purple of the six cardinal-electors, there will be exactly 120 cardinal electors -- the "quota" of cardinal electors set by Pope Paul VI -- by afternoon of that day. In only two weeks' time, the number of cardinal electors will again drop to 119, when Cardinal Scheid loses the vote upon turning 80 on December 8 of this year. Rorate has learned and can confirm that Bishop Richard Williamson, one of the four bishops consecrated by Archbishop Marcel Lefebvre and co-consecrated by Bishop Antonio de Castro Mayer on June 30, 1988, in Écône, Switzerland, for the Society of Saint Pius X (FSSPX / SSPX) has been removed from membership in said society by its Superior General, and can now be considered a former member. The removal comes at the end of an internal procedure that included repeated entreaties by the higher authorities of the Society regarding Williamson's decisions and actions that apparently went unheeded. On Saturday, October 13, 2012, on the occasion of the “Tradition Days” in Villepreux (France), Bishop Alfonso de Galarreta gave this conference, in which he analyzes the state of the relations of the Society of Saint Pius X with Rome. My intention is to speak to you about the qualities of the spiritual, Christian, Catholic militia, about the conditions that the combat for the faith must assume, and obviously to tell you a few words about the situation of the Society vis-à-vis Rome. The Book of Job says: “Militia est vita hominis super terram et sicut dies mercenarii dies ejus” (Job 7:1). Man’s life on earth is a time of military service, and his days are like those of a mercenary. This is Scripture, the Book of Job, that offers this very interesting image. 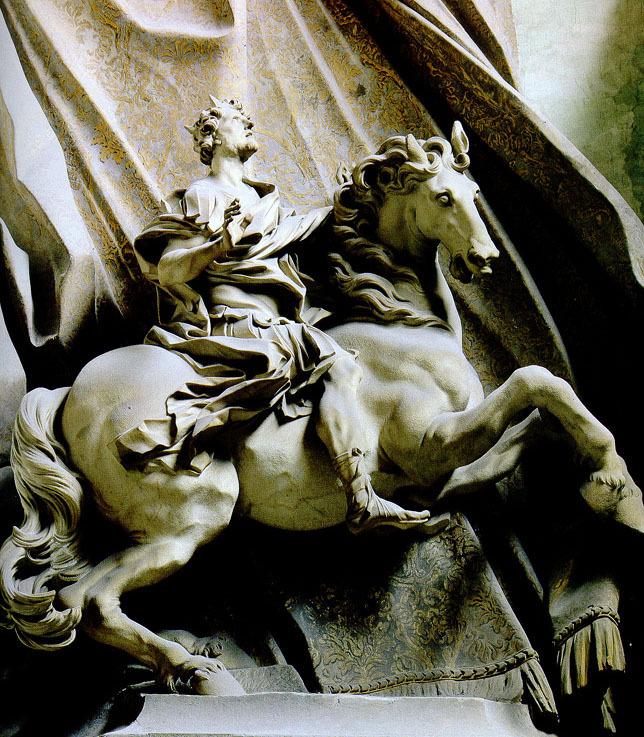 If the life of every man on earth is a combat, then much more so the life of the Catholic, of the Christian who is baptized and confirmed and therefore engaged in this combat for Christ the King. And I would say that if the life of every Christian is a combat, then the life of a Christian today is par excellence a struggle, a combat, a time of service. In this sentence we find a statement of the necessity of combat; it is necessary, it is our human condition, and that is not something new; always and everywhere people have had to fight. There is a combat in life, but above all a combat in order to win eternity, which implies many things. A little more than 34 years ago, on the day after his election to the See of Peter, Pope John Paul II gave his first radio message Urbi et Orbi, which most probably qualifies as one of his least-known and most neglected major speeches. 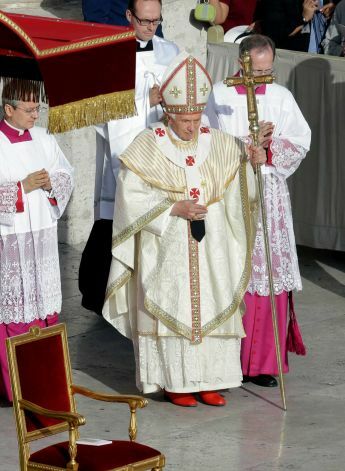 In this speech, the then-new Pontiff outlines his understanding of the proper way by which Vatican II should be interpreted and implemented. He speaks, on one hand, of the need to interpret the Council in the light of Tradition, and of the need for fidelity to the authority of the See of Peter. On the other hand he clearly speaks of the Council's proper legacy as something that goes beyond the documents themselves, involving the drawing out of many hidden things in the light of "experiments" and "changing circumstances". His thoughts are of great relevance to the debates of today, when some are insisting on a strict separation between Vatican II and its documents, and the nearly 5 decades of experimentation and radical change that came immediately after it. The fanon is back! And some notes on today's canonization rite. Most Holy Father, Holy Church, trusting in the Lord's promise to send upon her the Spirit of Truth, who in every age keeps the Supreme Magisterium free from error, most earnestly beseeches Your Holiness to enroll these, her elect, among the saints. SS. Jacques Berthieu, Pedro Calungsod, Giovanni Battista Piamarta, Carmen Sallés y Barangueras, Marianne Cope, Kateri Tekakwitha and Anna Schäffer -- pray for us! Recent decades have seen the advance of a spiritual “desertification”. In the Council’s time it was already possible from a few tragic pages of history to know what a life or a world without God looked like, but now we see it every day around us. This void has spread. - Philippe Cardinal Barbarin, Archbishop of Lyons and Primate of the Gauls, Interview with Paris Match, September 27, 2012. 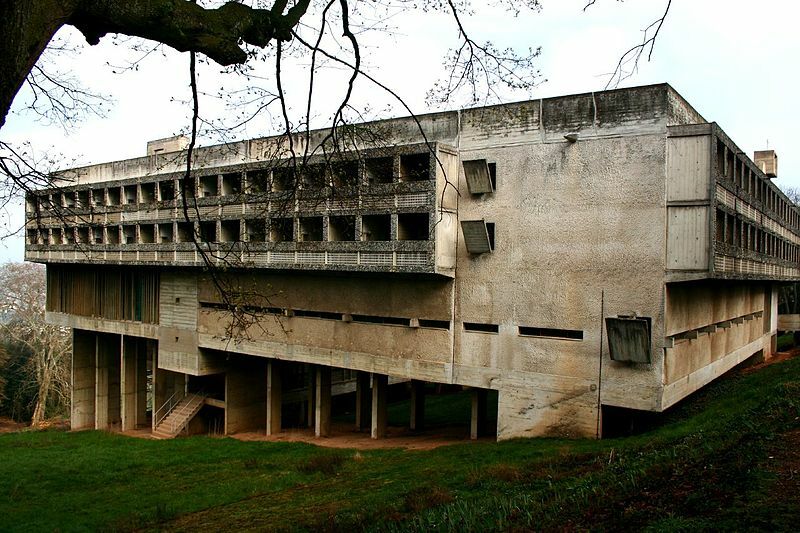 Le Corbusier, Dominican Monastery of Sainte Marie de La Tourette, 1960. Created to house a boom in vocations, it now houses less than a dozen Dominican friars. Source. 1961: 35% every Sunday or more, 33% sometimes, 24% never, 8% non-baptized. 2012: 6% every Sunday or more, 28% sometimes, 46% never, 20% non-baptized. A photogallery of the priestly and diaconal ordinations in Clear Creek Monastery on October 7, 2012 can be found in the monastery's Picasa gallery: Ordination of One Priest and Two Deacons. From the pictures, our readers will also be able to take note of the progress in the monastery church's ongoing construction. Since the beginning of Our Pontificate We have dedicated the greatest care in the religious instruction of the Christian people, in particular of the children, convinced that many of the evils that afflict the Church are caused by ignorance of her doctrines and laws. The enemies of the Church condemn them, blaspheming that which they ignore, and many of Her children, knowing them badly, live as if they did not exist. For this reason, We often insisted on the absolute necessity of Catechism instruction, and We promoted it everywhere, in accordance with Our power, both through the Encyclical Letter Acerbo nimis, and with dispositions regarding catechisms in parishes, with the approval and encouragement of Catechistic Congresses and Religion schools, and with the introduction of the text of the Catechism here in Rome, which has been used for some time now in some large ecclesiastical provinces in Italy. However, with the passing of the years and as a result of new difficulties interfering insidiously in the ordinary teaching of Christian Doctrine in the schools, where it was imparted for centuries, along with the provident anticipation of the First Communion for children, which We desired, as well as for other reasons expressed to Us, that is, a need for an adequate Catechism, one which was also shorter and more suitable for today’s necessities, We consented to reducing the Old Catechism into a new one, significantly condensed, which We, Ourselves examined and wished also to be examined by our brother Bishops in Italy, in order that they, according to their knowledge and experience, would express their opinion in general and indicate in particular the modifications to be introduced. Having received an almost unanimous favourable appreciation from them, with more than a few precious observations, which we ordered to be held in due account, it seems to Us, for various reasons, that we must not delay any further in a substitution of the text, recognized as opportune, trusting that with the Lord’s benediction, it will be more convenient and as much as, if not more, profitable than the old one, since the volume of the book and the things to be learned having been quite reduced, it will not discourage the youth, already seriously overburdened by scholastic programmes, and will thus permit teachers and catechists to make them learn it all. Here they will find, despite its brevity, the truths better explained and accentuated, those that nowadays are the most hardly fought, misunderstood, or forgotten, and which result in immense harm done to souls and society. In fact, we hope that even adults, those who wish, as at times they should, in order to live better and for the education of their family, to revive in their soul the fundamental knowledge on which the spiritual and moral life of a Christian is based, that they are to find this brief account useful and pleasing, very accurate even in its form, where they will encounter, set forth with great simplicity, the most important Divine truths and the most efficacious Christian reflections. This Catechism, therefore, and the prime elements from it that We have set out to be used, without any altering of the text, is for the convenience of children. We, with the authority of this letter, approve and prescribe to the ecclesiastical Diocese and Province of Rome the use of this text, forbidding, henceforth, the use of other texts in the teaching of catechism. Regarding the other Italian dioceses, the pledge is enough for Us, that the same text, which We and many other Ordinaries have deemed adequate, be adopted as well, so that the deadly confusion and discomfort that today so many experience in the frequent changes of abode, cease, when finding in their new place of residence, formulas and texts notably different which they have difficulty in learning, whilst at the same time, because of disuse, they confuse and ultimately forget even that which they once knew. It is worse for children, since there is nothing so deadly in obtaining good results from teaching as continuing it with a different text other than the one to which the youngster is more or less already accustomed. With the introduction of the present text, adults might encounter some difficulties, as some formulas have strayed from precedent ones, so it is for this reason, in order to remove these inconveniences, that We order that at all the main feast-day Masses, as also in all of the classes on Christian doctrine, that the initial prayers and the other principle formulas be recited, at the beginning, aloud, clearly, and in a composed manner. In that way, after a little while, without effort, everyone will have learned them. Thus, an excellent and amiable habit of common prayer and instruction will be introduced which has been in vigor in many Italian dioceses for some time now, with much edification and profit. In the name of the Lord, We strongly exhort all catechists, now that the brevity itself of the text eases their work, to explain the Christian doctrine with even greater care and allow it to penetrate the souls of young people, as today there is a greater need for solid religious instruction because of the spreading of godlessness and immorality. That they remember always that the fruit of the Catechism depends almost entirely on their enthusiasm, intelligence, and ability in rendering the instruction easier and more pleasing to their students. Let us pray to God that, as the enemies of the Faith who are currently constantly increasing in numbers and strength and who with every means go about propagating error, as many willing souls will rise up to assist parish priests, Christian teachers, and parents with great enthusiasm, in the much needed noble and fruitful teaching of the Catechism. It is with this wish that We heartily impart Our apostolic blessing to you, your Lordship, and to all those who will be the collaborators in such a holy mission. From the Vatican, October 18, 1912. 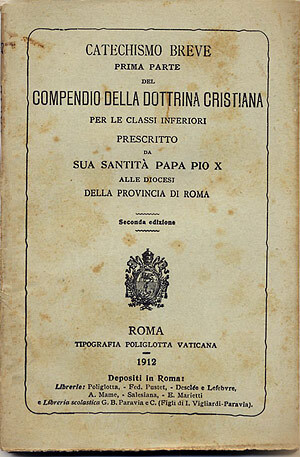 The definitive text of the Compendium of Christian Doctrine, widely known as "Catechism of Saint Pius X", was officially made public exactly 100 years ago, on October 18, 1912. Conceived by Pope Sarto in his permanent regard for the needs of each lay faithful, it was an important piece of his program of restoring all things in Christ - first, in the Ecclesiastical Province of Rome, then, by example, throughout the Church. This is, as far as we are aware, the first full translation made available in English and online of the letter Fin dai primordi, by which the Holy Pope consigned the document to the Cardinal Vicar of Rome. We thank contributor Francesca Romana for this new translation. Translation: Rorate caeli for this new translation of the document - Creative Commons Attribution 3.0 Unported License. SSPX-Rome: "We are back to square one"
An interview with Father Niklaus Pfluger, First Assistant General of the Society of St. Pius X, on the present situation of the Society. 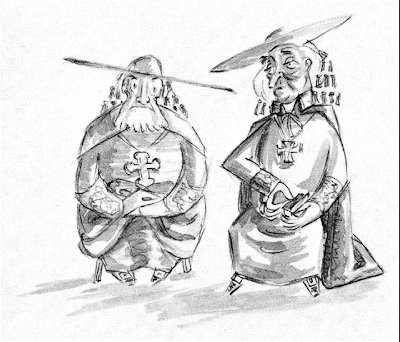 Kirchliche Umschau: Just a few months ago, the Vatican seemed to be on the verge of granting canonical recognition to the Society. It seems now that all efforts were in vain. Bishop Müller, the new Prefect of the Congregation for the Doctrine of the Faith, suggested as much in several recent interviews. 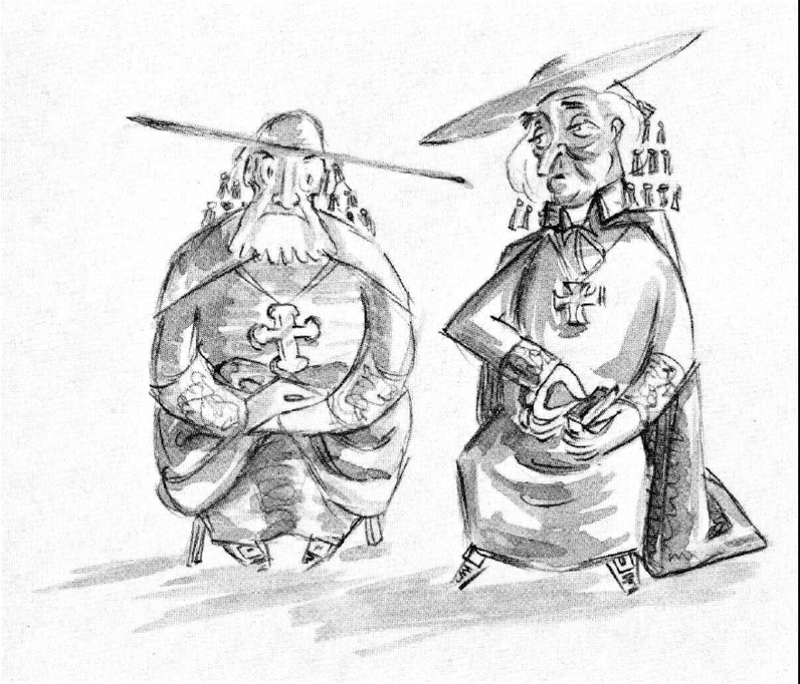 Father Niklaus Pfluger: All efforts were not in vain, but an agreement in the near future is improbable. In both our estimation and that of the Curia, any agreement would be pointless unless we are on the same page about what the Faith really means. This common understanding was to be expressed in a “doctrinal declaration”, which we took ample time in drawing up, and in April 2012, Bishop Fellay, our Superior General, presented a preliminary, informal draft. But, to our great surprise, this text was rejected by the Congregation for the Doctrine of the Faith. So we are back to square one. Kirchliche Umschau: How do you account for Rome’s change of direction? Father Niklaus Pfluger: In Rome there is a group strongly opposed to a canonical regularization for the Society. Such an official recognition would in effect be a sign that the post-Vatican II era is outdated and that a new chapter has begun. Of course, this would not suit the agenda of the Council’s supporters. For them, official recognition of the Society of St. Pius X would be not merely an insult, but also a questioning of the Council’s status, therefore a collapse. It appears that the Council’s adherents prevailed. Fides quaerens intellectum, theology exists only in relation to the gift of faith. It presupposes the truth of the faith and endeavours to demonstrate its "boundless riches" (Eph. 3:8), both for the spiritual joy of the whole community of believers and as a service to the Church’s evangelising mission. Today I can publish the 12th Position Paper in our series, on the teaching of Latin in Seminaries. The importance of Latin in the liturgy is, naturally and rightly, much discussed, and we have produced a Position Paper on this subject: Latin as a Liturgical Language. It is surprising to find, then, that Bl. John XXIII's Apostolic Constitution on Latin, 'Veterum Sapientia' (1962) has very little to say about liturgy. The arguments it gives for the teaching of Latin in seminaries are primarily connected with the importance of Latin for seminarians' academic studies, and its role as the Church's lingua franca. These considerations have been constantly stressed by the Magisterium, from the 1920s (and before) right into, and through, the period in which Latin was disappearing as a liturgical language for most Catholics. A major document on the importance of the study of the Fathers in Seminary, in 1989, makes the point yet again, somewhat pathetically one might think, that this can only be done properly if the students can read them in the original. This document is supposedly still in force. The point we wish to underline in this paper is that the Church is a society, and a society cannot function as a society without a common language. This society does not exist only between our contemporaries, but stretching back in time, and while of course Latin is not the only language in which our Catholic forbears wish to communicate with us, it is the overwhelmingly important one for Catholics of the Latin Rite. Latin is the key which unlocks the tradition of theology and spirituality, music and literature, law and history, as well, obviously, as the Papal Magisterium. And when we say 'Latin', 'having Latin' is not just a matter of doing a course in it and then forgetting all about it, it means having an easy familiarity with it, being able to pick up a Latin document and read the thing. Here's a question for all those nouvelle théologie types who used to go on about 'going back to the sources': how do you do that if you can't read them? Here's a question for all those liberals who still go on about 'collegiality': if the bishops of the world gathered today, in what language would they be mutually comprehensible? I've put up some more commentary on my own blog here. This position paper is available online as a pdf here. The next paper, on Holy Days of Obligation, will be published on 15th of November. Paper on Holy Week, the lectionary, and other topics, are in preparation. 1. Latin is important to the Church not only as a liturgical language, but also as a language of administration, discussion, and for the dissemination of ideas, notably in magisterial documents, and as the language of countless classic works of theology, history, and other disciplines, from the Fathers and the Scholastics, and well into the modern period. Latin’s use in practice as a language of communication in the Church depends on its being taught in seminaries (and also in Catholic schools); its place in seminary education has often been addressed by the Magisterium. On this topic, both the concerns, and the insights, of those attached to the Extraordinary Form of the Roman Rite, have application to the whole Church. Priests ordained without an education in Latin find it difficult, if not impossible, to use of the provisions of the Motu Proprio Summorum Pontificum; nevertheless, the argument of this paper will be based on wider considerations. The programme of priestly formation is to provide that students not only are carefully taught their native language but also understand Latin well. The verb ‘understand’ in the English translation understates the force of the Latin ‘calleant’: skill in, not mere comprehension of, Latin, is required by Canon Law, since Latin is a means of two-way communication. Moreover they are to acquire a knowledge of Latin which will enable them to understand and make use of the sources of so many sciences and of the documents of the Church. The study of the liturgical language proper to each rite should be considered necessary; a suitable knowledge of the languages of the Bible and of Tradition should be greatly encouraged. As far as the liturgy is concerned, the Constitution on the Sacred Liturgy, Sacrosanctum Concilium, as well as insisting that ‘the use of the Latin language is to be preserved in the Latin rites’, also assumes that clerics will normally say the Office in Latin. 4. These documents maintain earlier teaching and practice: notable 20th Century documents include Pius XI’s Apostolic Letter on seminary training Officium omnium (1922), the Congregation for Seminaries’ Letter Latinam excolere linguam (1957), Bl. Pope John XXIII’s Apostolic Constitution Veterum Sapientia (1962), and the ‘Ordinationes’ applying this (Sacrum Latinae linguae depositum, 1962), and Paul VI’s Apostolic Letter on seminaries, Summi Dei Verbum (1963). Immediately following the Council Pope Paul VI again commanded the retention of Latin, particularly in the Office, in his Apostolic Letter Sacrificium laudis (1966); in 1976 he established the ‘Latinitas Foundation’ to promote Latin. Blessed Pope John Paul II stressed the importance of Latin in his Apostolic Letter Dominicae Cenae (1980), and the Congregation for Catholic Education published an Instruction on the study of the Fathers, which stressed the need to bolster the study of Latin and Greek in seminaries, so that seminarians might read patristic texts in the original (Inspectis dierum, 1989). I ask that future priests, from their time in the seminary, receive the preparation needed to understand and to celebrate Mass in Latin, and also to use Latin texts and execute Gregorian chant; nor should we forget that the faithful can be taught to recite the more common prayers in Latin, and also to sing parts of the liturgy to Gregorian chant. In August 2012 it was announced that the Holy Father would publish a Motu Proprio replacing the Latinitas Foundation with the ‘Pontificia Academia Latinitatis’, with a wider remit for the promotion of the language. 6 To summarise, in no sense can it be said that the Council represented a change in the teaching, or called for a change in the practice, of the Church on this subject. The reasons given in these documents for the importance of Latin fall into a number of related categories. The first concerns the place of Latin in the liturgy. This is stressed by Pope Benedict XVI in Sacramentum Caritatis, as quoted above. This subject has been treated in a previous Position Paper; it suffices to say here that it is impossible for priests to be obedient to Sacrosanctum Concilium’s command, ‘the use of Latin is to be preserved in the Latin Rites’, without at least a basic grasp of the language. to ponder what they wish to give up, and not to let that spring run dry from which, until the present, they have themselves drunk deep. 9. Thirdly, the patrimony of theology, philosophy, canon law, and history, of the Latin Church is preserved, overwhelmingly, in Latin. For Church documents, the Latin version is nearly always the normative one, and so cannot be set aside; translations have, indeed, proven to be far from perfect. For all documents composed in Latin, a translation, however skilful, can never capture all the nuances of the original; again, for many important documents of the Magisterium, including those of the recent past, translations do not exist, even for major vernacular languages; the same is true of a great many major works of the theological tradition. Latin has always been seen as essential for the preservation of accuracy and continuity in doctrine, a point stressed in Veterum Sapientia. The importance of Latin for academic studies is stressed by Officiorum omnium, Veterum Sapientia, Optatam totius and Inspectis dierum. 1 Fourthly, there is the role of Latin as the language of the Church: a language for the exchange and development of ideas. The administrative importance of Latin is stressed by Veterum Sapientia 4 and Optatam totius 13. 1 This last point, on the importance of Latin as a common language for the Church, is worth developing further. At the Second Vatican Council the participants and their advisers were able to make and understand speeches and interventions, and to consider multiple versions of proposed documents, in a single language, Latin. A discussion among the bishops of the world along these lines would today be impossible, raising the question of whether the Church could again hold a General Council, should the need arise. 1 There is, of course, a model of multilingual organisation presented by the United Nations and the European Union, but such organisations, despite their abundant resources, are faced with great difficulties. It is not possible to produce a document in several languages and assert with any conviction that all the versions have precisely the same meaning. If, instead, the product of a multilingual deliberation is an official document in a single language, then those familiar with that language are given an enormous and unfair advantage. It is not surprising, then, that international diplomacy has always had a strong tendency towards a lingua franca (whether it be Latin, French, or English), a language in which every educated person can comment intelligently, and with mutual comprehension, on texts under discussion, and understand the significance of proposed changes, however small. 1 The need for precision in discussing and formulating documents is enormously greater in the Church than in secular diplomacy, and the importance of bishops gathered in Synod or General Council to be able to contribute to, and understand, discussions, is of the highest significance. The lack of Latin today, even at the higher ranks of the clergy, has contributed to a tendency towards using some convenient vernacular language in a particular meeting, or for the development of a particular document. This is problematic, because it places at a disadvantage, not to say disenfranchises, those less familiar with the language used, and creates a linguistic gap between discussions and the official documents, in Latin, which derive from them. A situation in which an important Latin proposition is not actually discussed by those in whose name a document is promulgated, since they discussed instead a form of words in some other language which a translator thought equivalent, has the potential for disaster. 1 It may be useful to reiterate that there is no alternative to magisterial documents, with rare exceptions, being promulgated in Latin, since they must be able to refer to and develop the formulations of earlier Latin documents in a seamless way, and must not be rendered misleading or incomprehensible by the rapid changes typical of vernacular languages. 1 The reality of the Church today is that she is a community without a common language. She has, instead, a number of overlapping languages, between which communication proceeds through translators of varied expertise, many of them working for the media or on the internet. Ease of communication in the Church, both between nations and between generations, is steadily decaying as an older generation who benefited from a Latin education are replaced by a younger generation who, frequently, did not. It is not surprising that Canon Law, and the Papal Magisterium, has been so emphatic about the importance of Latin. It is a matter of utmost urgency that Latin be restored to its former place of honour in seminaries, and for that matter in Catholic schools, particularly boys’ schools and junior seminaries.